If you have any questions about the ARIES information page below please contact us. The well proportioned luxury yacht ARIES is a motor yacht. 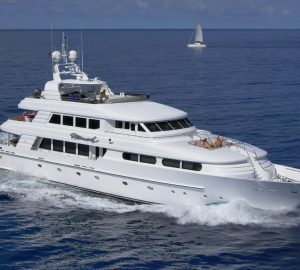 This 32 m (103 foot) luxury yacht was developed at Cheoy Lee Shipyards in 1989. ARIES was formerly named Aries Ii; Katharine. Superyacht ARIES is a stately yacht that can sleep up to 10 people on board and has around 6 crew members. The yacht's general design work came from Jack Hargrave. The technical naval architect firm plans are the products of Jack Hargrave. Created at Cheoy Lee Shipyards the yacht was constructed in the recognised yachting country Hong Kong. She was successfully launched in Hong Kong in 1989 before being delivered to the owner. The hull was crafted from composite. The motor yacht superstructure is made mostly using composite. With a beam of 7.25 metres or 23.8 feet ARIES has moderate size. A shallow draught of 1.98m (6.5ft) limits the list of overall harbours she can enter into, contingent on their specific depth. This yacht contains twin DDC main engine(s) and can find a swift continuous speed at 16 knots. The engine of the yacht generates 1080 horse power (or 795 kilowatts). Her total HP is 2160 HP and her total Kilowatts are 1589. Her propulsion units are twin screw propellers. As for the yacht’s stabalisers she utilises Naiad. This yacht’s accomplished cruise speed is 14 knots which gives a range of 4000. The well proportioned luxury yacht M/Y ARIES can accommodate up to 10 passengers and 6 crew. Total engine power output 2160 HP /1589 KW. The luxury yacht ARIES displayed on this page is merely informational and she is not necessarily available for yacht charter or for sale, nor is she represented or marketed in anyway by CharterWorld. This web page and the superyacht information contained herein is not contractual. All yacht specifications and informations are displayed in good faith but CharterWorld does not warrant or assume any legal liability or responsibility for the current accuracy, completeness, validity, or usefulness of any superyacht information and/or images displayed. All boat information is subject to change without prior notice and may not be current.